Japanese whaling ship attacked and sank the high-tech vessel, Ady Gil, of the Sea Shepherd conservation society during a collision in the Southern Ocean on January 6. 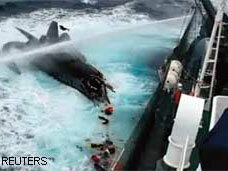 Crewmembers were rescued by another Sea Shepherd boat. The activists are chasing the Japanese ship that plans to kill 935 minke whales and 50 fin whales this year breaching international laws. Cuba has formally rejected the Copenhagen Accord in a submission to the UN Framework Convention on Climate Change. With this, the accord will not become an official concensus decision. Green groups criticize the accord as it lacks binding emission reduction targets for rich countries. Chinese customs officials seized 8,500 tonnes of used tyres shipped illegally from usa to China for disposal. China bans import of scrap tyres out of health and environmental concerns. Some chemicals in tyres leach into water, and disrupt hormones and damage the liver. Tens of thousands of Filipinos, displaced by the rumbling Mayon volcano, headed home after geologists lowered the alert level and said there is low probability of an explosive eruption. In a bid to diversify its client base away from Europe, Russian prime minister Vladimir Putin launched the long-awaited Siberian oil export route, giving energy-hungry Asia a new supply source from the world’s largest crude exporter. Iran has proposed to swap its low-enriched uranium for nuclear fuel for reactor-grade fuel, but insisted the exchange should happen in stages. It had earlier rejected an offer by the International Atomic Energy Agency to ship its low-enriched uranium abroad to be processed into reactor fuel. Indonesia banned importing vannamei shrimp seedlings from Asian countries, including India, for six months to prevent viruses from entering the country. Shrimp is Indonesia’s major foreign exchange earner. Despite opposition by farmers’ groups, Mali granted long-term leases to foreign agro-businesses to cultivate 160,000 ha of land . The government said it cannot develop its agricultural potential without foreign investment. Despite international pressure on Zimbabwe’s government to curb illegal diamond trade , President Robert Mugabe’s security officials are reported to have taken control of the Marange diamond field. usa has lifted a 22-year immigration ban which stopped anyone with hiv/ aids from entering the country. The move precedes the US plan to host a bi-annual global hiv/aids summit, for the first time, in 2012.